Wearing a sharara-style jumpsuit (don’t quite know what else to call it! ), Lucky attended the Bachchans Diwali bash. Neither a fan of the design nor the bag that she opted to pair it with. This isn’t the first time Lucky was spotted in a Gaga outfit. She wore a sari for her wedding anniversary but decided to bunch up the pallu with a tie, a move that we just didn’t get! P.S. You can catch Deepika wearing a Gaga dress here. 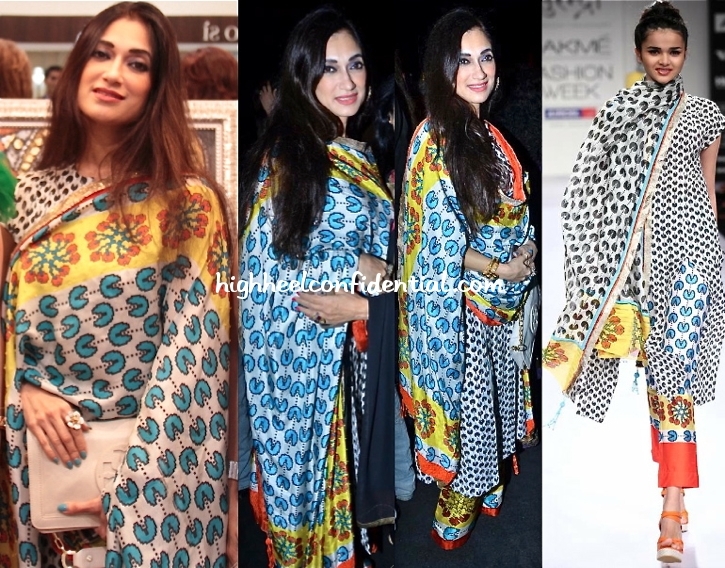 At two back-to-back events on a recent evening, Ms. Morani became the latest to be sporting the pac-man print. Up until now, we’ve unequivocally loved the print. This time around though, we couldn’t help but think it was a tad too overwhelming. Wish Ms. Morani had worn her hair away from the face and the pants cropped like presented on the runway. A Tory Burch bag completed her look. The question perhaps isn’t who fared well but, who didn’t fare as bad. Because, let’s face it, neither the hue nor the outfits themselves are doing much for these ladies. While both these ladies stepped out in Just Cavalli at the ongoing Fashion Week, neither of them made much of an impact. Not digging Ms. Morani’s shimmery pants or shoes that she paired the Cavalli top with. Preeti’s much-too-large a tote for the dress she had on (would’ve preferred a smaller bag/clutch) was least of her problems. The lovely new mom just needed to go up a size with her dress; the fit of her Cavalli was way, way off! We thought Ms. Morani might have learned some pointers having walked the ramp at fashion week. Clearly, we were very wrong!